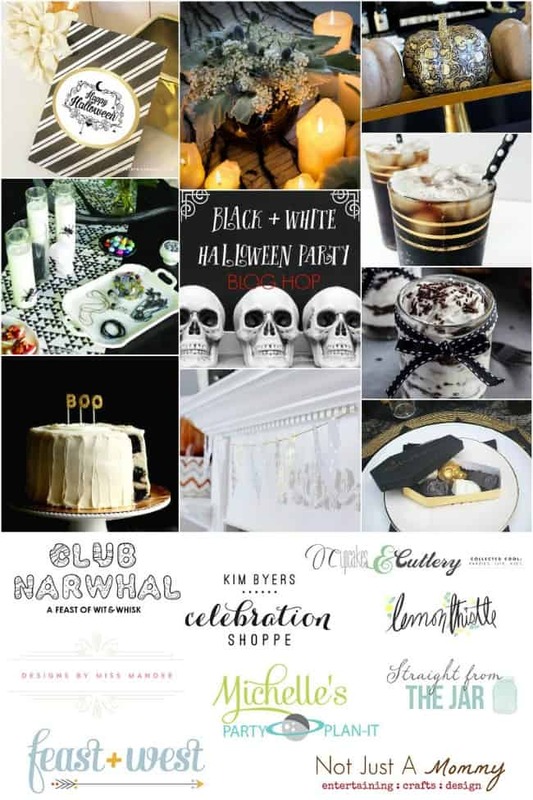 This Black, White + Gold Halloween party post is courtesy of our contributor Dawn of Not Just A Mommy…I love Halloween, especially when using a non-traditional color palette! Black, white and gold is a classic and elegant color palette that works for every occasion, especially for a Halloween party! one. Pumpkin place card from Charlottesville Wedding Blog. two. Dress up in metallic winged lashes from Barney’s. three. Target’s tablescape is full of inspirational ideas. five. Decorate party cups with This Heart Of Mine. six. I heart Paper Luxe’s foil cocktail matches; I don’t even want to use them! seven. Make meringue mice with Better Homes & Gardens. eight. Serve your gruesome fare on D.L. & Co’s chandelier plates. nine. Fill your party space with studded pumpkins from The Life Styled. 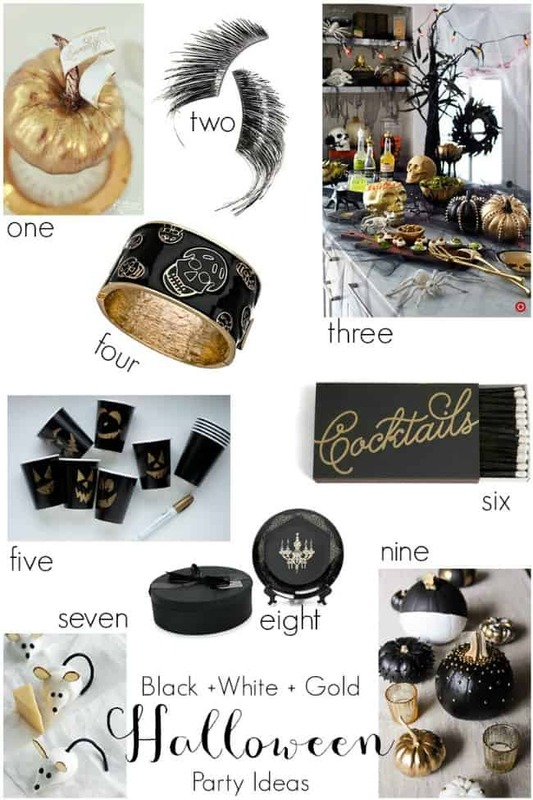 Need more black, white and gold Halloween party ideas? Check out my blog hop with eight fabulous, creative bloggers for party ideas from invitations to favors. We’d like to send a big THANK YOU to Dawn of Not Just A Mommy for gathering all these clever ideas for us! I know I’m ready to start planning a stylish party for all my girlfriends now! Over on Dawn’s blog you’ll find plenty of party ideas for all of life’s celebrations. I hope you’re ready to plan a party because she’s sure to leave you inspired! Be sure to follow her on Facebook, Pinterest and Twitter for even more creative ideas. Love your ideas! Gold adds that sparkly special touch to everything!